Not a lot of technical comments on this one; I wanted to keep it very basic and muted. For anyone who’s hazy on the Sword of Damocles, the story goes that Damocles was a courtier of Dionysius II of Syracuse who used to tell his boss that being king is the most awesome life ever, so Dionysus let him have the job for a day. 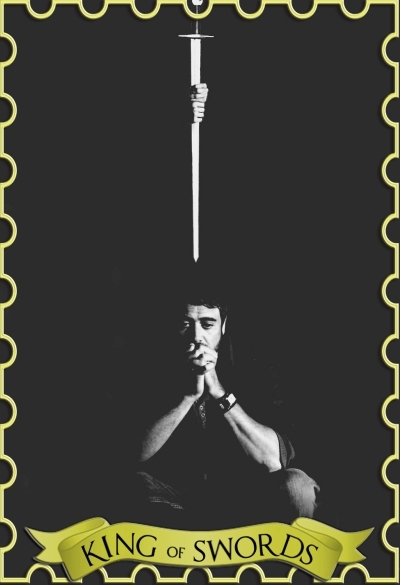 Damocles was having a great time being king, till he looked up and saw a sword suspended from a horse-hair dangling over his head, at which point he decided being a regular schmuck wasn’t such a bad deal either. Basically, it’s about how being in charge is dangerous and terrifying, but also that no matter who you are or how happy you are, you’re never more than a horse-hair away from total disaster. John’s odds, of course, were even worse than that. I’m a big fan of the idea of John as a closeted lord king geekboy, and the card’s description doesn’t necessarily suggest anything this dire. But it did make me think about John’s choices, and his relationship with knowledge and judgment for the time that we know him–things he wasn’t allowed to know, secrets he kept through a ruthless self-exile, even the fact that he went off the ledge of one world and into another–twice–and never got back. For most of his time in the series, among the human characters, he knows alternately the most or the least about what’s really going on, and as Sam and Dean eventually learn, that’s an awfully rough way to live your life. Whether John is Dionysius or Damocles in this little scenario is a toss-up; I think maybe he’s the guy who can’t stand to see anyone else under the sword. –I’ve had that John cap for years; I couldn’t even guess where I found it at this point. My thanks and apologies to the uncredited original capper, whoever you are.